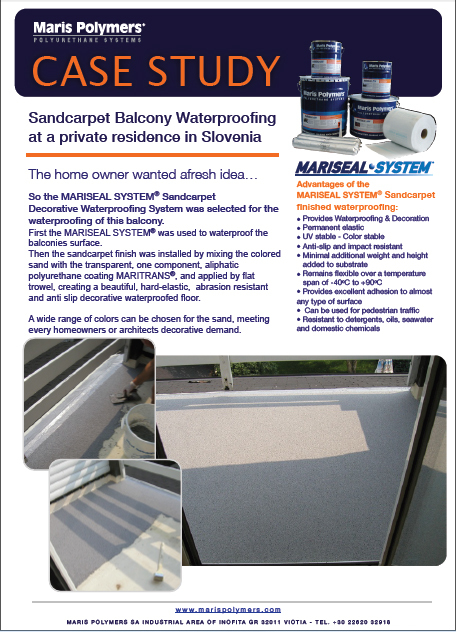 First the MARISEAL SYSTEM® was used to waterproof the balconies surface.So the MARISEAL SYSTEM® Sandcarpet Decorative Waterproofing System was selected for the waterproofing of this balcony. 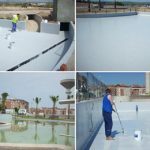 Then the sandcarpet finish was installed by mixing the colored sand with the transparent, one component, aliphatic polyurethane coating MARITRANS®, and applied by flat trowel, creating a beautiful, hard-elastic, abrasion resistant and anti slip decorative waterproofed floor. 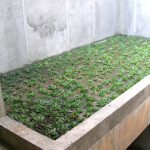 A wide range of colors can be chosen for the sand, meeting every homeowners or architects decorative demand.